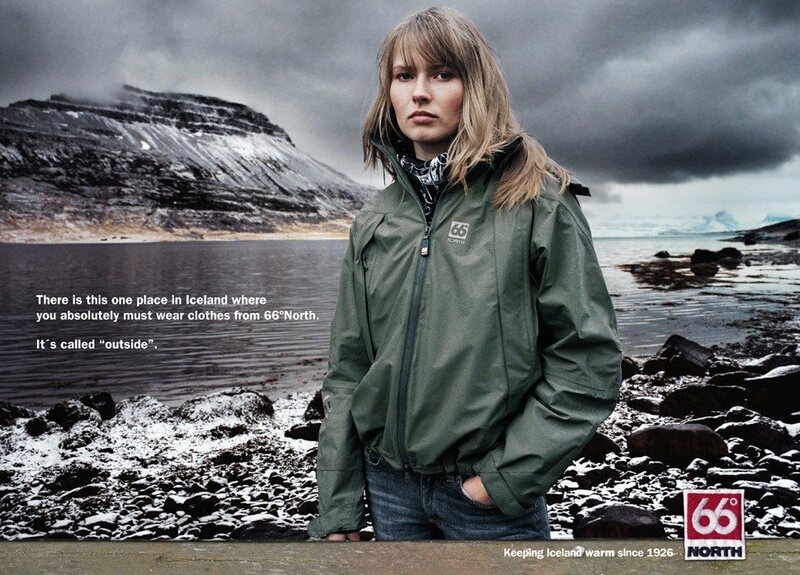 You don’t need to know Icelandic to succeed with ad campaign in Iceland, you just need to know their customs. I’ve been all around Iceland including very distant places, in many small towns and all bigger cities (bigger in Icelandic reality), and nowhere I’ve found billboards as we know them – big signs standing next to the road or shiny in cities on random (all?) buildings. I need to admit that in cities there is resemblance of billboard in form of a ‘big poster’ but they are only placed on buildings which they advertise (like Bonus poster on Bonus shop) or as a way to indicate direction to get there (with arrows or kilometres). Thanks to that we can actually admire Iceland’s beautiful nature, not irrelevant products with insignificant brands. Such an idyll scenery is possible due to two reasons: first – it’s the same that disqualifies trees – wind (sometimes reaching even up to 72m/s). It’s worth saying that there were a lot of trees in Iceland before first settlers. But they brought sheep and cattle so they needed pastures. That’s why they cut out all the forests to make grassland. Unfortunately the only species of trees that grows in Iceland is birch and sheep eat those seedlings. If any survive they have to fight wind. Lack of billboards uncovers the surrounding, which amazes everyone. That’s why it creates kind of social pressure not to cover it. Anyone who disobeys won’t be receipted well. That’s another reason. Also due to Icelanders’ ubiquitous presence in the Internet (95% of households do have access to the Internet) and Facebook (72% of whole population) it’s best to advertise on the web not with billboards. Especially bearing in mind low anonymity in Iceland resulting from small population and numerous families – they actually know their friends from Facebook so their recommendations are more genuine. Most Icelanders are fluent with computers and also acquainted with newest technological trends. They are early adopters of new technologies and social platforms. Icelandic government is aware of that fact and initiated a campaign www.inspiredbyiceland.com to promote tourism among foreign colleagues of Icelanders. As a result, a 20% rise in inward tourism was noticed. Another campaign set to boost Iceland’s reputation around the world was www.icelandwantstobeyourfriend.com. Social media not only been used to boost tourism but also to rework Iceland’s constitution. Suggested changes had been published in a post with a request to comment and give feedback (sic!). Thus, if we’re considering advertising in Iceland – Internet should be the first choice. But not the only one. Many companies eg. in tourism sector put their ads on busses, their company’s buildings (densely located on the route airport – capital) and in the form of leaflets. Leaflets luckily are not spread by people on the street to random passers-by but are presented in nice, neat leaflet stalls located around main touristic places. Everybody does it so it’s another must. Another way of advertising is either by being present on websites that consociate companies from given group (like budget.is with various car rental companies) or by placing an ad in specialised magazine. It’s key to reach targeted audience and Icelanders do read such magazines. We also shouldn’t forget about oral references. It’s especially valid on Iceland where Icelanders can easily get information about given company from first hand – it’s important to leave good impression on each of our clients. In terms of content and images that work best to attract Icelanders, eg. in advertisement, it’s always family on first place. Broadly speaking family bonds, meetings, kids, health. On second place there’s tradition (everything from Vikings to sheep breeding), independence (also cultural and language distinctness), severe weather and nature conditions (hardness, cold baths, glacier walks, snow mobiles rides) and last but not least beauty of Icelandic nature (healthy and natural). By not understanding those features we won’t succeed in Iceland. As an example, Icelanders mock people with umbrellas. It’s almost a sign of weakness for them (true Vikings). So trading with umbrellas on Iceland may not be the best shot. But as it’s raining in Iceland almost every day – there’s definitely a niche. And that niche had been fulfilled by Icelandic world-famous company North 66 (on the market since 1926), which created a collection of outdoor clothing suited for severe climate of the island and hit home. They knew the problem, found solution but also were aware of Icelanders’ limitations.